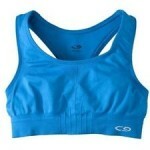 With this new Target Cartwheel you can get 50% off Champion sports bras! Please note that the cartwheel expires today so you’ll have to head to the store today. This Cartwheel is valid through today only. Note that each store may have different products at different prices.